Nottingham's Ellis Guilford Sports Centre was recently the focus of a new wheelchair badminton club launch - only the 2nd club of its kind in England. 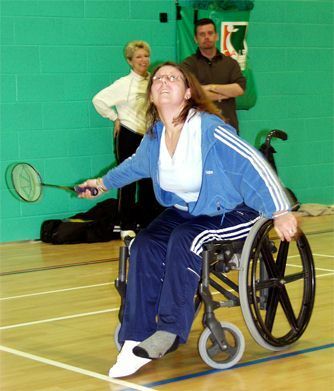 Elaine Spray, Nottinghamshire Badminton Association's Development Officer, who has worked tirelessly to open this club, said "wheelchair users of any age or ability, disabled and able bodied people are welcome to come along and try this new sport." "There will be many people in the Nottinghamshire area who would welcome the opportunity to try something different, meet new people and have a great deal of fun. Age is no barrier for this sport. The first few sessions are free for you to try wheelchair badminton." "We have managed to secure five specialist sports wheelchairs funded by the Lord Taveners which will arrive soon. This will allow us to offer people who use 'day chairs' to experience this very sociable sport for themselves. We also have fully qualified coaches on hand." Last October, Nottinghamshire & Leicestershire came together to organise an 'Open Day' event for wheelchair badminton. It was a great success with wheelchair users and able bodied people of all ages having a great time. There was a varied mix of people from all parts of the country. A wheelchair badminton squad from Macclesfield demonstrated how the game should be played. This fun day identified the need for more wheelchair badminton clubs in the Midlands as Macclesfield Wheelchair Badminton Club is currently the only one in England. They desperately need more clubs in England to challenge. Nottinghamshire has taken this initiative and the new club has now been formed at the Ellis Guilford Sports College a new facility at Basford, Nottingham. This superb venue has only been open to the public a few weeks. The club is on Friday evenings between 7.00 pm and 9.00 pm at the Ellis Guilford Sports College. You'll be sure of a very warm welcome!